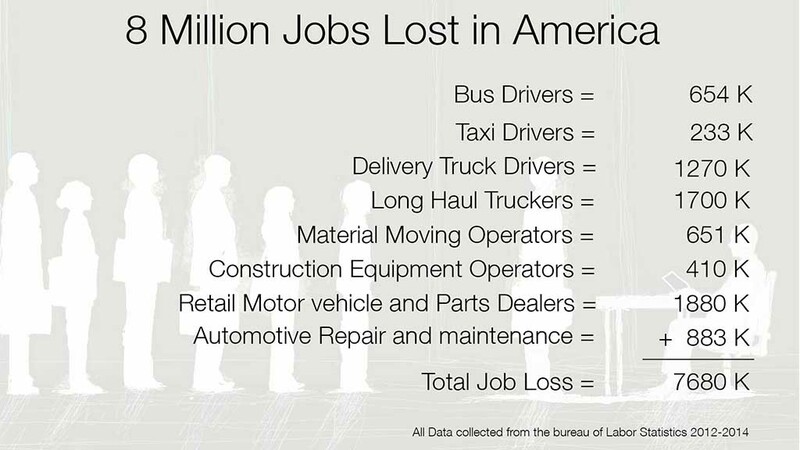 Will there be unemployment resulting from the advent of autonomous vehicles? In the short term, you betcha. Here’s a list of just some of the major professions I see being impacted by the widespread adoption of autonomous vehicles. Here are links to all those numbers. This is obviously a disaster to all the people working in these professions and their families that should not me minimized. But keep in mind this transition is going to happen over the course of several decades, so there’s time for people to retire, train for new careers and figure out that these are the “buggy whip” professions of the 2020’s and 2030’s. I am deeply empathetic to the economic hardship this structural change in our economy will cause these industries, but suggesting in 2015 that autonomous vehicle technology is a net evil because it will put eight million people out of work is like saying in 1990 that the internet is a bad thing because it will put all the postmen in the unemployment line. The internet grew our economy more than perhaps anything since the industrial revolution or WWII industrialization and it created industries we couldn’t have even imagined in 1990. It wasn’t that hard to postulate Amazon or Craigslist, but could anyone have imagined Match.com? Or chat rooms? MMPOGs? Bitcoin? Doggles? LuckyWishBone? This is fun, I could go on all day, but suffice to say, the list is very, very long of industries and the tens or hundreds of millions of jobs that the internet has created. In spite of the immediate job loss, autonomous vehicles will ultimately create a productivity revolution by freeing 75 billion hours Americans are currently spending sitting behind the wheel.9 I believe this productivity revolution will unquestionably have a net positive effect on our economy.